We trust companies who design, manufacture and sell medical implants and devices to provide safe and effective products that will help us live better lives. When these companies put out defective products there can be horrible results sometimes requiring further surgery or worse, which can kill a patient. Mr. West, as an associate at the Law Offices of Ned Good prepared a case against a medical implant designer/manufacturer which produced plates and screws used in spine surgeries. 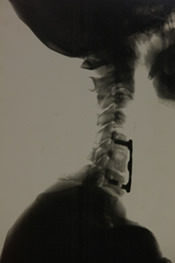 Mr. West’s client underwent neck surgery, in which the approach was from the front, and in which defendant’s plate and screw combination, was used to stabilize the neck while it healed. The screws used in the surgery had been hollowed out and had had holes drilled through the threads by design; the idea being that bone would grow through the holes making the screws become part of a rigid bony structure in the neck, holding them in place better than if they were simple screws. Unfortunately, as shown by Mr. West’s experts, the holes made the screws more susceptible to breaking and would do so before the bony ingrowth could occur. The result, screws would break and the plate would lift and rub against other tissue and parts of the patient’s body, in this case including the esophagus, a very dangerous problem. The patient had to undergo a second surgery to have the screws and plate removed. The case settled, but not after a long hard battle, during which the parties were back and forth to the Court of Appeal not less than four times. In an unpublished Court of Appeal decision, Mr. West was successful in arguing a claim for punitive damages could be brought against the defendant for conscious disregard of the plaintiff’s safety. A heart defibrillator is supposed to provide a shock to the heart to keep it beating if the heart stops or begins an irregular beat. In doing this, a person’s life is supposed to be prolonged for a long time. When the defibrillator malfunctions though, it will literally kill the person. This was the case of one of Mr. West’s clients’ mother. A manufacturer of defibrillators had a problem with the leads coming lose and shorting out, causing them to malfunction and shock the person, and in this case, to death, in front of several of her adult children and a grandchild. There were so many victims of this product that all of the cases nationwide were combined into one multidistrict case. Mr. West was successful in presenting his clients’ case and obtaining one of the largest settlements of all presented to the settlement panel and District Judge.